Flamenco Vivo Carlota Santana. Photo by Angelica Escoto. BOTTOM LINE: Flamenco Vivo Carlota Santana has a fresh and joyful take on traditional and contemporary flamenco. Flamenco Vivo Carlota is the oldest flamenco company is the U.S. For the last 32 years, director and choreographer Carlota Santana has been educating audiences, and for the last 5 years has expanded to teaching children in schools. As she explained, she has one foot and the other foot is moving forward into a modern and fresh look at flamenco. This is done not only with the dance steps, but also in use of the steps, costume and the music. The traditional flamenco music is played but also various pieces are spiced up with percussion, chimes, a flute and even a saxophone. We hear and see both where we started and where we are going. 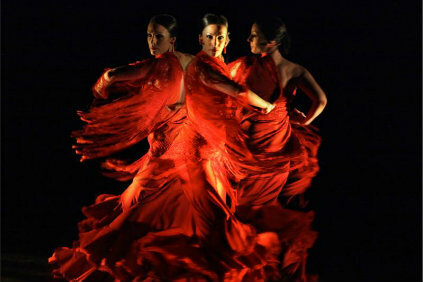 The female dancers whip and kick their long skirts called bata de colas in the first piece of Program B: Mujeres. These costumes usually limit the women’s movements but here the women seem so natural as they whip the trains around like a tail that it didn’t occur to me that every flamenco company didn’t dance like this. A woman came out with castanets and tapped out rhythms that seemed impossibly fast and another woman made sweeping gestures with the fan. All the while, the men’s solid staccato footwork served as a precise and masculine foundation to the rest of the show. Not only was the dancing passionate and fiery, but I felt like I saw all the elements to flamenco condensed into Mujeres. It was a great introduction. The second piece on the program didn’t include any dancing. The piece, called Musica -- literally music -- left the stage full of the 6 musicians who made up an integral part of the performance. The dancers and the musicians worked together to weave a tapestry of sound that resonated through the entire auditorium. Once the dancers were offstage, the audience felt the tempos and energy of the music soar. At the finale of the show, each of these musicians all raised in the tradition of flamenco, took turns dancing for us. They all showed bravado and are enthusiastic dancers even providing some comedic steps. I left feeling even more in awe as the music and dance are clearly equals, and it seems in order to master one, you must master both. The third piece, Martinete-Sequiriya, started with 3 dancers lit in spotlights. The lights faded in and out on them as they each completed each other’s movements and emphasized parts of the fan work in the choreography. The man and two women had equal, non gender-specific roles. This was quite beautiful as one of the more abstract pieces of the evening focusing on the rhythm derived from a hammer being pounded by workers in the forges, and the oldest form of flamenco, Sequirira. Not every piece required context. A solo by Isaac Tovar called Alegrias, which means joy, brought the show to a carefree and coolly nonchalant place. He would complete difficult dance passages and then pace back around to start over. He was like the flamenco equivalent of Gene Kelly as he jumped spritely and then conversely pounded out movement with gusto. The two other solos were just as different. Antonio Hidalgo danced an elegant solo, Musica Y Baile to guitarist Gaspar Rodriguez's virtuosic playing. It was pensive, dark and wrought with tension. It mimicked the music almost as if the notes were lifted off the paper and translated into steps. As happy and dark as the two men danced, Guadalupe Torres brought a drama and sadness to her solo, Ausenia. She began in a pool of light with a shawl around her and she expertly danced with it. At moments, her feet trembled so quickly it seemed that she was floating. The last piece was truly a celebration of flamenco, but not only of all the performers were feeling it. It was the outpouring of love for everything flamenco spilling offstage. The audience clapped along with the last piece of music. When it ended, they jumped up out of their seats to give these generous performers a standing ovation.